Mental health disorders according to the World Health Organization are one of the leading causes of disability worldwide. Three of the ten leading causes of disability in people between the ages of 15 and 44 are mental disorders, and the other causes are often associated with mental disorders. Depression is a common health problem, ranking third after cardiac and respiratory diseases as a major cause of disability. Depression is a debilitating and pernicious cluster of symptoms that may persist for a period of weeks, months, or even years. It is an affective disorder that presents with depressed mood, loss of interest or pleasure, decreased energy, feelings of guilt or low self-worth, disturbed sleep or appetite, and poor concentration., It is also characterized by changes in mood status presenting as feelings of sadness which may fluctuate from slight hopelessness to severe feelings of disappointment., It is a disorder that can be reliably diagnosed and treated in primary care. If left untreated in the early age of occurrence, it can lead to different problems such as school failure, conduct disorder, and delinquency, eating disorders such as anorexia and bulimia, school phobia, panic attacks, substance abuse, or even suicide. Researches indicate that there is a negative relationship between depression and academic achievement, that is, when depression is high, academic achievement is low and vice versa. For example, Hysenbegasi et al. in 2005 conducted a study in Western Michigan University and they found that depression has a strong impact on academic productivity among the students. According to their study, of the 121 depressed students who were diagnosed in the campus health center, 14.64% had missed a great number of classes, 5.45% missed assignments, and 1.36% and 0.74% of them missed examinations and dropped a number of courses. Psychological morbidity in undergraduate students represents a neglected public health problem and holds major implications for campus health services and mental policymaking. In terms of life quality, understanding the impact of this neglected public health phenomenon on one's educational attainment and prospective occupational success is very important. This study was therefore conducted to determine the prevalence and academic risk factors for depression, among students of Ahmadu Bello University (ABU), Zaria, Nigeria. This is a cross-sectional descriptive study conducted in ABU, a federal government university located in Zaria, Kaduna State, Nigeria. The university has two campuses located on 7000 hectares of land; Samaru (main campus) and Kongo in Zaria. It consists of 13 faculties, sixty 60 academic departments, and 12 research institutes and specialized centers. The university offers undergraduate and postgraduate courses in diverse fields such as agriculture, public and business administration, engineering, environmental design, education, biological and physical sciences, medical and pharmaceutical sciences, the humanities, law, and social science. The university has a large medical program with its own ABU Teaching Hospital, located in Shika, Zaria, one of the largest teaching hospitals in Nigeria and Africa. Currently, the university has a total of 42,283 undergraduate students. The distribution of students by faculty is shown below. A minimum sample size of 117 was obtained using the following formula: n = Z2pq/d2. After correcting for nonresponse rate of 10%, the sample size became 129. However, a sample size of 131 was used for the study. Proportionate allocation method was used to determine the number of students required for the study, per faculty. Simple random sampling was then used to select the students to whom the questionnaires were administered until the desired sample size was achieved. Data were collected with the aid of structured, self-administered questionnaires with close-ended and open-ended questions, using the Open Data Kit application. The questionnaire has seven sections as follows: section 1 covers sociodemographic profile of respondents, section 2 their anthropometry, section 3 social variables, section 4 academic variables, section 5 past experiences, section 6 religiosity, and section 7 depression assessment. Section 7 is an adaptation of the Patient Health Questionnaire (PHQ-9) which is used to make tentative diagnosis of depression in at-risk populations, for example, those with coronary heart disease or after stroke or university students. It is also used to monitor the severity of depression and response to treatment and it has 61% sensitivity and 94% specificity in adults. The PHQ-9 scores each of the nine DSM-IV criteria as “0” (not at all) to “3” (nearly every day). For each of the nine criteria, respondents are expected to read every detail of the alternatives and to circle the one which applies to them. Depending on the total scores obtained, respondents are assigned into five categories of depression severity: 0–4 none, 5–9 mild depression, 10–14 moderate depression, 15–19 moderately severe depression, and 20–27 severe depression. A computer-based software, Statistical Package for the Social Sciences (SPSS version 20.0), was used to analyze the data. Data were presented using tables and charts, with the Chi-square test used to test the significance of associations at a level of P < 0.05. Ethical clearance was obtained from the Health Research Ethics Committee of the Ahmadu Bello University Teaching Hospital, Zaria, Kaduna State, Nigeria (Reference No. ABUTHZ/HREC/UG/6). Consent was obtained from the respondents who were assured of strict confidentiality by ensuring anonymity. A total of 131 questionnaires were administered and 127 were completely answered, giving a response rate of 96.9%. 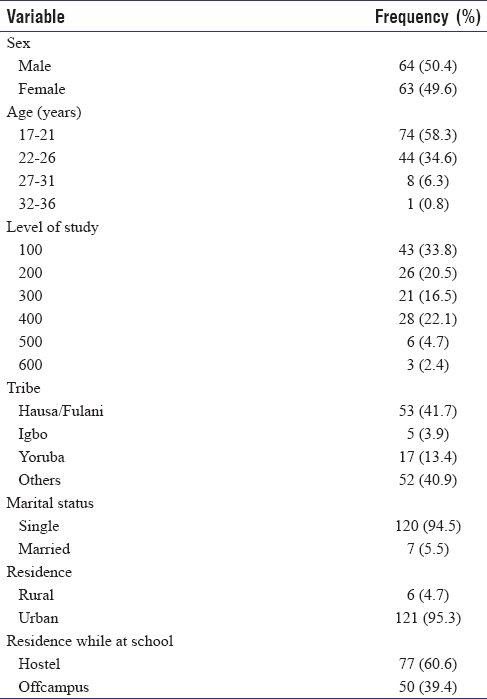 [Table 1] shows the sociodemographic characteristics of the respondents. As shown in the table, 50.4% of the respondents were male and the rest were female. Majority of the respondents (58.3%) fell within the age group of 17–21 years. The least frequency (0.8%) was in the age group of 32–36 years. The lowest and highest ages of the respondents were 17 and 34, respectively. For the level of study, the highest proportion (33.8%) was 100-level students, while 600-level students had the least representation (2.4%). Most of the respondents (94.5%) were single and the Hausa/Fulani ethnic group had the highest proportion of respondents (41.7%). Most of the respondents (95.3%) reside in an urban setting, while 4.7% reside in a rural setting. Also, while at school, a majority of the respondents (60.6%) reside in university hostels while 39.4% reside offcampus. 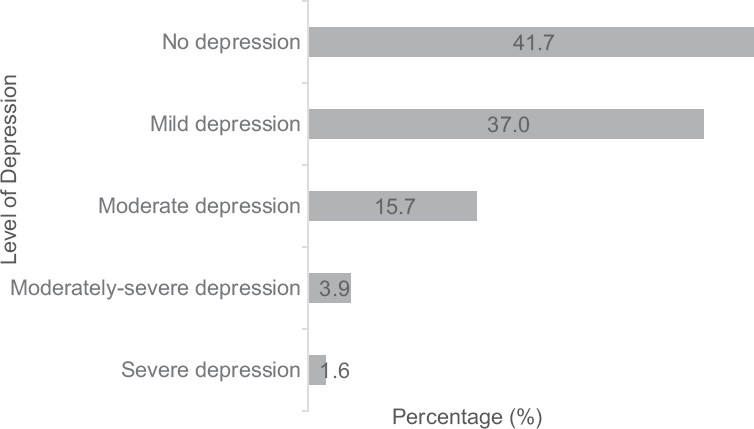 [Figure 1] shows the level of depression among respondents. As shown in the figure, 58.2% of the respondents were found to have depression, with 37.0%, 15.7%, 3.9%, and 1.6% having mild, moderate, moderately-severe, and severe depression, respectively, according to the PHQ-9 scoring system. [Table 2] shows the association between depression and academic variables. It shows that there is no statistically significant association between depression and any academic characteristic such as academic performance (P = 0.360), interest in the course of study (P = 0.266), and level of study in university (P = 0.467). A descriptive cross-sectional study was carried out among 127 respondents who were all undergraduate students of ABU, Zaria. The study had more male respondents than female. The age range of respondents was 17–34 years, with a mean age of 21.34 years. The prevalence of depression in this study was found to be 58.2%, with 37.0%, 15.7%, 3.9%, and 1.6% of respondents having mild, moderate, moderately-severe, and severe depression, respectively, using the PHQ-9 as a screening tool for depression. This finding is similar to that of another study that was conducted among students of a private medical college in South India which showed that 58% of students had various forms of depression, with 43%, 12%, and 3% of the students having mild, moderate, and severe degrees of depression, respectively, also using the PHQ-9 to screen for depression. However, it is a bit lower than the findings of a study done in Fayoum University, Egypt, using the Depression, Anxiety and Stress Scale-21 (DASS-21), which showed a 60.8% prevalence of depression among the students, and another study done in Tabriz, Iran, using the Beck's Depression Inventory (BDI), which showed that 62.7% of the students had depression, with 10.9% of them having severe depression., The prevalence in this study is significantly lower than the 70% found among Pakistani university students. The lower prevalence observed in this study may be due to the cultural and religious differences as well as differences in the educational system and lifestyle in the regions where these studies were carried out, as such factors have been shown to affect the manifestation of depression. It may also be due to differences in the screening tool used, as none of the above researches used the PHQ-9, as was used in the present study. The findings from the study, however, are higher than what obtained in previous studies carried out in Nigeria. One carried out in Western Nigeria using the Center for Epidemiologic Studies Depression Scale (CES-D) showed a prevalence rate of 25.2% and 7% for moderate to severe and severe depression respectively; another study carried out in Enugu showed a prevalence of 23.3%, and a third study showed a prevalence of depression of 8.3% among Nigerian university students, with 5.6% of them having mild-moderate and 2.7% having severe depression. Possible explanations for the variation in the prevalence of depression found in this present study and that of previous studies conducted among university students are likely due to variation in the instruments used. Instruments used to diagnose depression in other studies include the CES-D, DASS-21, BDI-II, and PHQ-9. There is also variation in cutoff points used for diagnosis, using the various tools for screening. Difference in the time of the study, as well as the difference in culture and lifestyle in the various regions where the studies were carried out, may also account for the variation in results. Further research is recommended to identify other nonacademic risk factors for depression among university students in our study area. This will guide in formulating policies for prevention and control of depression in the study area. It is also recommended that more attention should be given to the identification and management of depression among university students in the study area. Furthermore, health education and counseling on depression and available coping mechanisms should be provided to students in the university, especially during orientation programs. One limitation of the study is that responses depend on the truthfulness of the respondents since some respondents might not be forthcoming with information. Using PHQ-9 for screening for depression and lengthy questionnaire bias are other limitations. Depression, at different levels of severity, was noted among respondents. More screening and counseling services should be made easily accessible to students in the study area. Further research on nonacademic factors that could predispose to depression is recommended. This will aid in formulating policies for prevention and control of depression in the study area. We acknowledge all the respondents who participated in the study. Yusoff MS, Abdul Rahim AF, Baba AA, Ismail SB, Mat Pa MN, Esa AR. Prevalence and associated factors of stress, anxiety and depression among prospective medical students. Asian J Psychiatr 2013;6:128-33. Marcus M, Yasamy MT, Mark VO, Dan C, Shekhar S. Depression: A Public Health Concern; 2012. p. 6-8. Available from: http://www.who.int/mentalhealthmangement/depression/whofmh2012.pdf. [Last accessed on 2017 Jun 16]. Ahmadu Bello University. Available from: http://www.en.m.wikipedia.org/wiki/Ahmadu_bello_University. [Last accessed on 2017 Jun 16].